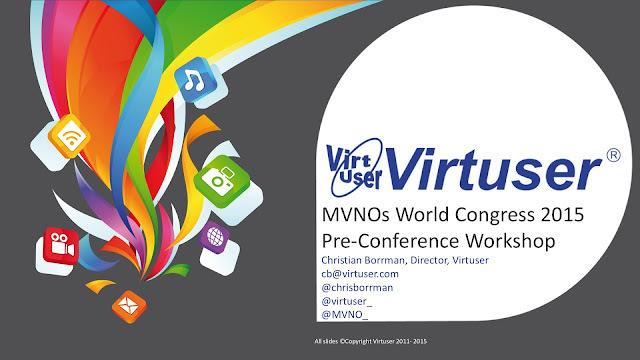 I had the pleasure of running the MVNO world Congress pre-conference workshop in the 2015 #MVNOIS, so as we run up to the 2016 MVNO event in Amsterdam its probably time to upload some of the slides to give you an overview and share some of the experience. The workshop was in three parts, this is the first part that focussed on MVNO Marketing, which in my now 16 year of doing MVNOs, is the hardest hurdle after the MNO agreement and MVNE plus all the other service provision contracts selection. The second part focusses on MVNO Data. 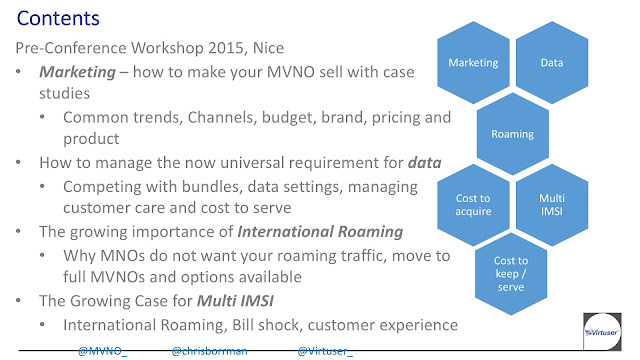 I Will cover the MVNO Data services, MVNO International Roaming, and MVNO Multi-IMSI points in the next few days / weeks running up to the 2016 Conference, as these areas are key, if not the key way an MVNO can differentiate itself from other MVNOs and moreover its host MNO and grow scalability in a competitive mobile market. An Activity every MVNO should do almost daily! 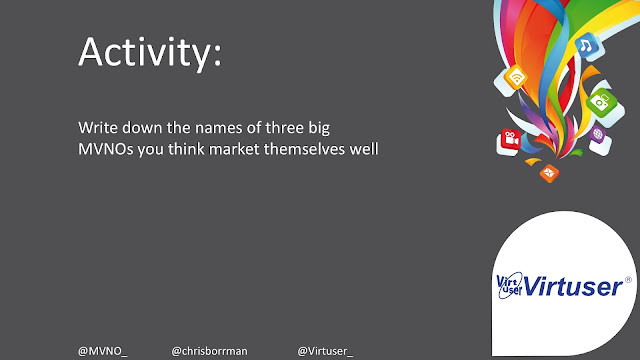 The first task was to name 3 Big MVNOs that the audience think market themselves well. This is important on many levels. Firstly, if there are none of them in your market you need to ask some serious questions about why and make sure you are not repeating any of their mistakes! 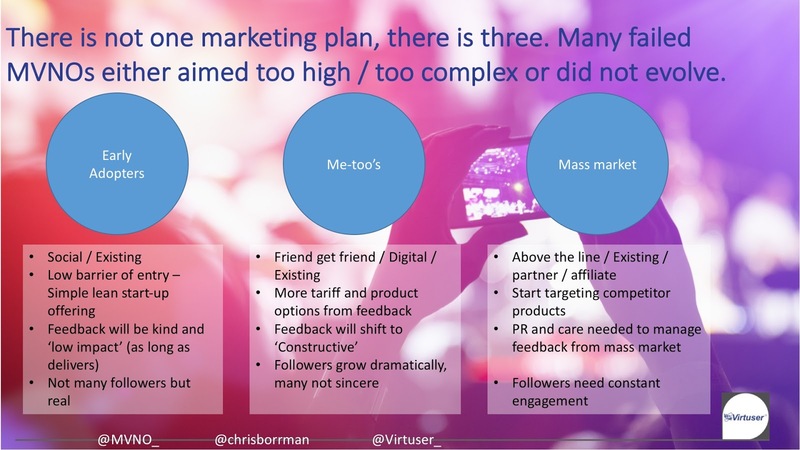 Secondly, it is where MVNOs most differentiate themselves at conception, but most easily compromise on in launch... and to be honest, from there they often never launch and/or never become successful. To be a successful MVNO you need to be able to easily access all the needed data on your customers, process this and send targeted below the line packages at them. The key here is that they are below the line, competitors do not see them, customers love and recommend them, but your competitors do not copy them. I want you to think about this as you go through the slides, and I add my 3 top MVNOs further down. 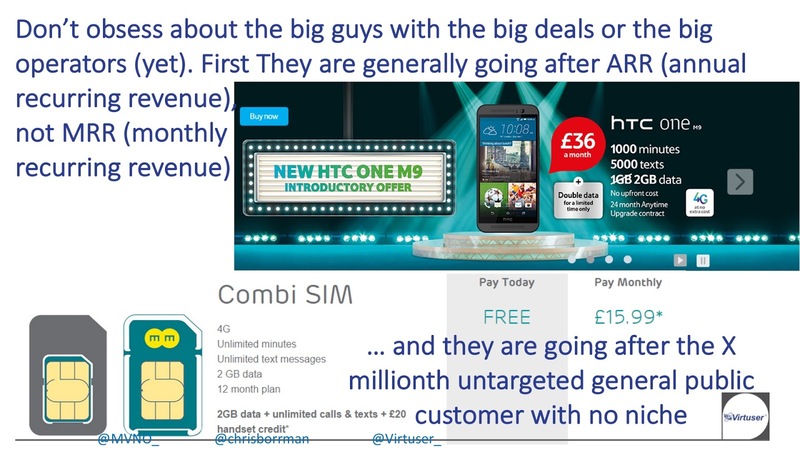 This is sadly where a lot of marketing time is wasted by MVNOs - above the line copy cat price competition - why? Most MVNOs develop what I cal a bi-polar frankenstein approach to Marketing. Bi-Polar as they flit between being slightly cheaper that their most expensive competition, to undercutting the cheapest offer from the biggest MNO in an instant. Frankenstein as the first marketing and even product set, is usually stolen from every MVNO that has ever existed in 5 countries, over 3 MVNO models in 6 different niches... and the result is, well usually awful! what time do they call? what handsets IMEI/MSISDN database are they using? what locations are calling from frequenting? what locations are they running out of credit? where are they topping up? how much and how often are they topping up? what top-up channels are they using? what type of data are they using, where and how fast? All this is in the CDRs, GGSN and HLR, and needs to be available to the OCS needs to be fully integrated with this, as well as a tool to bulk SMS, and report who has what SMS, as while you will be marketing daily, its not good to market the same customers more than a few times per month for obvious reasons. "If you cannot name 3 MVNOs from your territory that do this well, its most likely that they do not have access to this data, and if you do not, then you will not be a leader either"
OK I jumped a few slides here on refining product and marketing, however this slide leads on well from above as well as: When an MVNO examines its subscriber acquisition costs (SAC), ARPU and Churn, it very quickly sees that MVNO led customer to customer and MVNO to customer led marketing obtain customers cheapest and keep them the longest. It is important to have a mix of SAC but these need to be kept down to grow successfully as an MVNO. 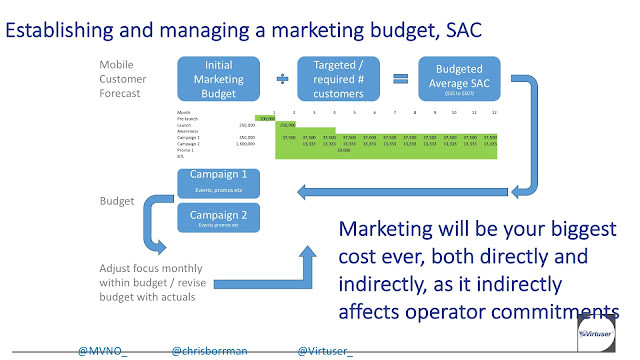 Choose and adapt from successful MVNOs, but avoid "Bi-Polar / Frankenstein" campaigns! Draw on what has worked and what is (see previous slide) is in budget. EE recently did a huge above the line campaign with Kevin Bacon, which is beyond any MVNO marketing budget, however its OM4G and 4GEE twitter coverage was cheap and genius and well within MVNO budgets. Back to the three MVNOs from the activity above, go through these points. In my workshop I then went through the above key points for three MVNOs I think market themselves well. My examples were deliberately different: Lyca Mobile, Virgin Mobile and Tesco Mobile; the key being that while they are very different MVNOs in very different segments, theirs USPs focus on points that the MNO and other MVNOS find hard to copy, they deliver what they promise without extensive T&Cs, and typically their most successful packages are no where near as cheap, nor anywhere near as expensive, as the cheapest / most expensive MNO offerings of the "Bi-Polar" approach to pricing. 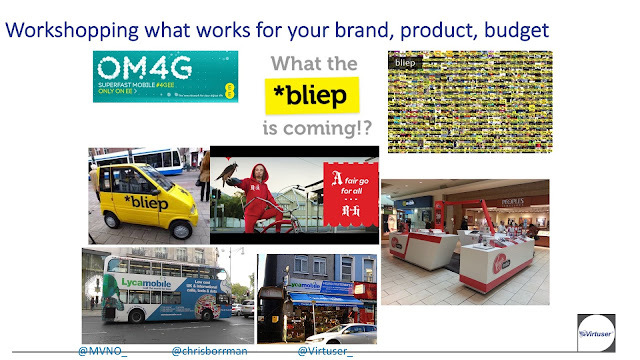 Which brings me to the last slide of the Marketing section, and my most copied slide. Every MVNO that has been successful has evolved through these stages, many that have failed have failed to adapt, either because. They just did not evolve. Some ethnic MVNOs started with a multi-language USP, but as customers learn their host country language the product needs to evolve, or the countries expand. They could not evolve operationally - if the reporting is manual spreadsheets... you are not going to market successfully beyond early adopters. When launching an MVNO you can get by with the basic tools that an MVNE and the host MNO gives you, as long as this includes: CDRs, IMEI, HLR location of LUs, all transactions, collated top-up info, SMS marketing tools and reports, reconciliation, GGSN logs, etc. These need to be accompanied with the ability to update data settings OTA, edit the SPN OTA, change tariffs real-time, etc, etc. 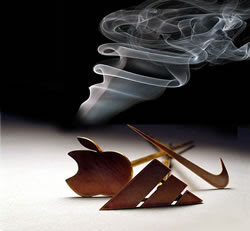 and usually require another 10-20 services to be sourced and integrated to move beyond early adopters. These are the keys missing from failed MVNOs or underperforming MVNOs. I hope you find these slides useful and informative. Feel free to paste these slides into your own presentations, as many do, but of course please do the basic common courtesy of quoting where the content is from if you do change the appearance and/or remove any logos, watermarks, etc.